Background: Respiratory syncytial virus (RSV) is the most commonly isolated virus causing acute bronchiolitis. It typically presents with rhinorrhea, followed in a proportion of children by lower respiratory tract signs. An in-vitro study demonstrated no difference in infectivity to rhinovirus in upper and lower epithelial cells.1 Viral replication following RSV infection has not previously been studied in matched paediatric primary bronchial epithelial cells (PBEC) and primary nasal epithelial cells (PNEC). Aims: To compare viral replication following in-vitro infection of matched paediatric PBEC and PNEC. Methods: PBEC and PNEC were obtained from paediatric subjects by non-bronchoscopic bronchial and nasal brushings following the induction of anaesthesia for elective surgical procedures. The matched PBEC and PNEC were cultured to passage three and were infected with a wild-type RSV A at a multiplicity of infection of 0.1 and also with mock infection. Cell lysates were collected in duplicate at regular post-infection time points up to 96 h post-infection and were used to measure viral replication. Viral replication was determined by serial dilutions to look for evidence of cytopathic effect and expressed as log 50% tissue culture infective doses (TCID50)/ml. Repeated measures analysis of variance was used for statistical analysis of viral replication over the postinfection time course. Results: Matched PBEC and PNEC were obtained and cultured from six paediatric subjects with a median age of 5.2 years (range 2–8 years). PNEC supported significantly greater wild-type RSV A replication than PBEC (p<0.01) over the experimental time course. Mean carbon dioxide (CO2) in each baby during weaning. Conclusion: There is greater viral replication of wild-type RSV A in PNEC than in the corresponding PBEC. This may not be the case with rhinoviral infection and may help to explain why RSV is more frequently isolated as a cause of acute bronchiolitis than rhinovirus or other respiratory viruses. Background: The best strategy of weaning preterm babies from nasal continuous positive airway pressure (CPAP) is unclear. There are few scientific data to support any one method of weaning. Aim: To compare the respiratory outcome of babies weaned from CPAP with time cycling or pressure weaning, after a change in unit policy. Methods: This was a retrospective analysis of babies requiring CPAP in our neonatal unit born at 32 weeks’ gestation or less during July 2006 to January 2007 (time cycling, n = 14) and June 2007 to May 2008 (pressure weaning, n = 14). Results: We compared the 14 babies who had time cycling with 14 who had pressure weaning. Both groups were similar in terms of median gestation and birth weight. 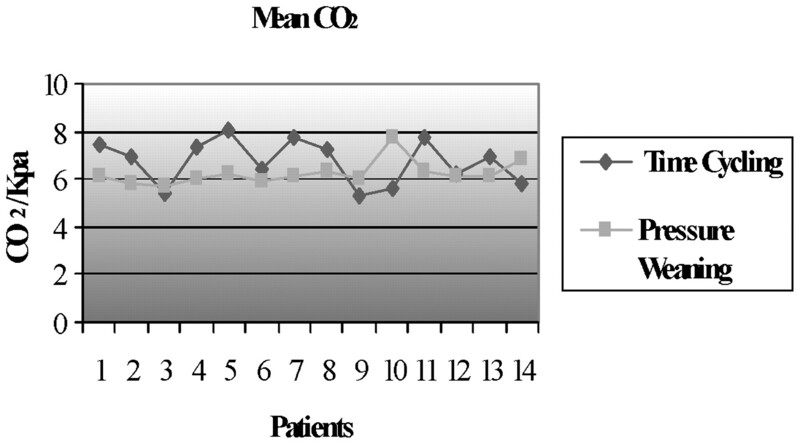 The mean duration of CPAP was 31.4 days (range 5–87) in time cycling compared with 15.6 days (range 5–72) in pressure weaning. Failure rates were 28.5% in time cycling (n = 4) and 14.3% in pressure weaning (n = 2). Three babies developed chronic lung disease in time cycling and one in pressure weaning. Babies in the time cycling group had relatively high mean carbon dioxide compared with the pressure weaning group (see fig). All those who failed weaning by either method (n = 6) were less than 1 kg and later needed combined methods of weaning. Stylised apparatus for structured light plethysmography system. Conclusion: Pressure weaning seemed quicker and more successful compared with time cycling. Time cycling results in an increased incidence of hypoventilation. However, very low birth weight babies may need time cycling when on minimal pressure. A randomised controlled study is needed to support these findings. 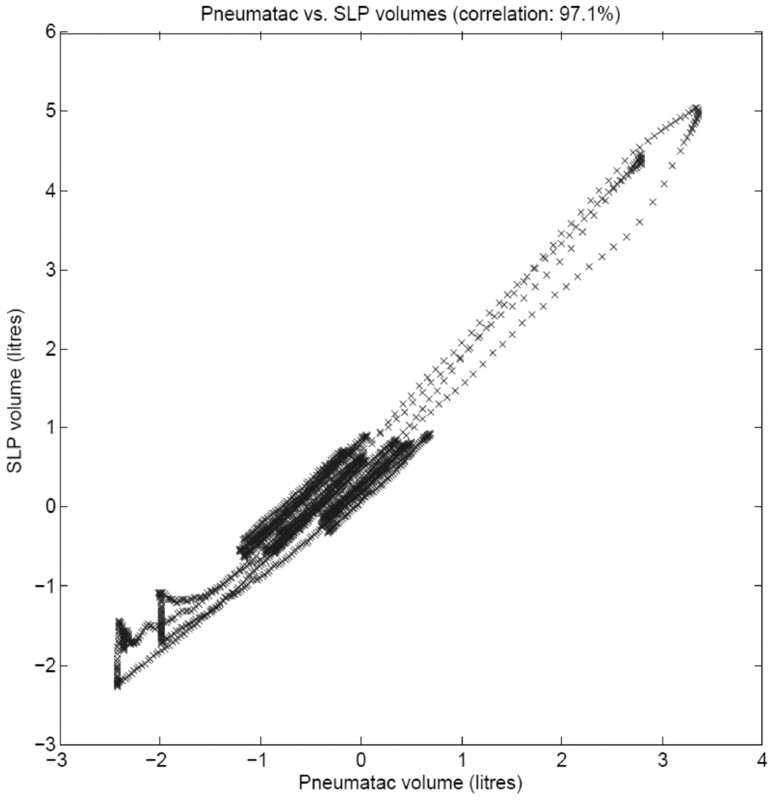 Plot of measured volumes structured light plethysmography (SLP) versus pneumatic (correlation 97.1%). Introduction: Diseases of the chest are the cause of significant morbidity and mortality in young children. However, the severity and effects of intervention are often difficult to quantify. Many tests of infant lung function are invasive, requiring a facemask to be applied to a sedated child. Cohort: Five children (aged 4–16 years) and four adults in good health. Method: Tidal breathing and forced spirometry were measured and exported for analysis using a pneumatac and J-scope software (Cardinal Health Care). 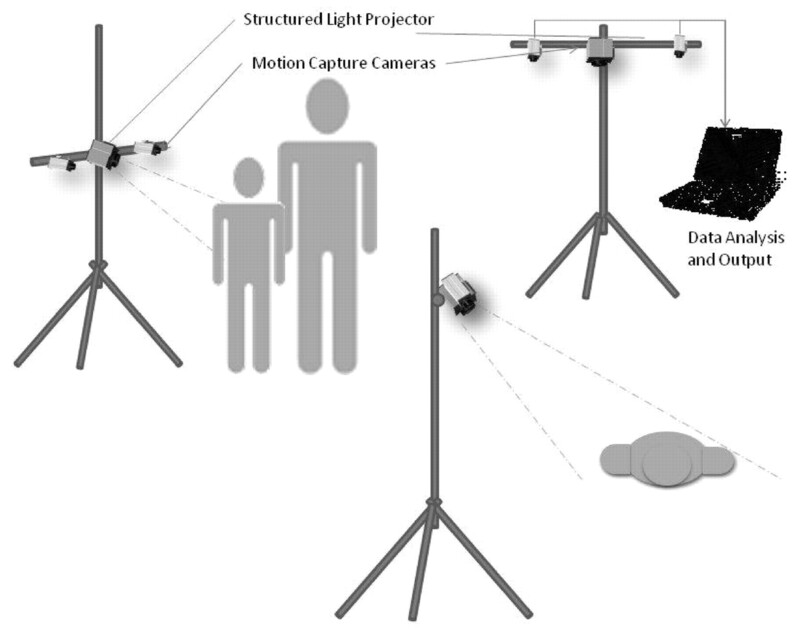 Structured light plethysmograph: The capture hardware consists of two video cameras and a video projector (see fig 1). A complex grid is projected onto the child’s chest. The relative shape and movement of the grid defines the thoracic volume and changes in volume. A standard computer is used for data analysis and processing. The system autocalibrates using standard and well-tested computer vision algorithms as the data are being gathered. A secondary calibration is performed before a measurement by placing an object of known size in front of the cameras. No component of the capture device makes physical contact with the child. The individual does not need to be sedated nor does it require a measuring device to be placed on any part of the child. The lack of contact reduces infection risks and allows breathing patterns to be measured without error introduced by the abnormal nature of breathing into a measurement device. Results: We have shown a correlation of r2 = 0.97 when compared with tidal breathing and forced spirometry (see fig 2). Conclusion: The methodology is currently being further validated in children and adults. New methods of data interrogation, such as Fourier, spectrogram and wavelet analyses are being applied enabling novel endpoints in the interpretation of respiratory disease. Spirometry is the most commonly used lung function technique for follow-up of children with lung disease. However, recent evidence suggests that forced expiratory volume in 1 s (FEV1) is relatively insensitive to mild cystic fibrosis lung disease.1 As part of the EPICure study2 we used a wide range of lung function tests in 49 children born extremely preterm and 52 controls at a mean age of 11 years. Aim: To assess the feasibility and to determine the most discriminative test for this population. Methods: Measurements of plethysmographic lung volume (respiratory volume (RV)/total lung capacity (TLC)) and specific resistance (sRaw), multiple breath washout (lung clearance index (LCI)), diffusion capacity (diffusion of the lung for carbon monoxide (DLCO)) and spirometry (FEV1, forced expiratory flow in the mid range (FEF25–75%)) were undertaken by all children. Abnormal lung function was defined as being outside the normal range (±2 Z-score) based on existing reference range and control data. Results: sRaw proved to be the most feasible, whereas DLCO was the least successful (see table). Using spirometry alone would have missed abnormalities in 10 (29%) extremely preterm children that were detected by LCI, sRaw, RV/TLC or DLCO. However, the discriminative ability (area under the receiver operator characteristic curve) and sensitivity of these alternative measures of lung function were lower when compared with either FEV1 or FEF25–75%. Data from the prospective control group were essential for appropriate interpretation of these results. Conclusion: In contrast to findings in children with cystic fibrosis, spirometry proved to be the most discriminative test in this population of extremely preterm children, especially when flows were also reported. Congenital central hypoventilation syndrome (CCHS) is a rare congenital disorder, characterised by abnormal ventilatory responses leading to hypoventilation during both rapid eye movement (REM) and non-REM sleep. Heterozygous de novo polyalanine expansion mutations of the PHOX2B gene have been reported in over 90% of children with CCHS. There have been suggestions that the severity of hypoventilation may be related to the size of the polyalanine expansion. The aim of this study was to assess whether the expansion in the PHOX2B gene was related to the minute ventilation in REM and non-REM sleep. In our centre children with genetically confirmed CCHS have had routine assessment of ventilation during sleep since diagnosis. 15 children (six females, nine males) aged from 1 month to 12 years have had at least one assessment of minute ventilation. Low minute ventilation was observed in the majority of subjects in both REM sleep (0–230 ml/kg per minute) and non-REM sleep (0–120 ml/kg per minute). There was high inter-subject variability of minute ventilation but no correlation between fragment length expansion and minute ventilation in either sleep state. In addition, no relationship was found between polyalanine expansion size and the change in ventilation over time within subjects. Although other studies have suggested that the length of PHOX2B expansions correlate with disease severity, we were unable to confirm this using objectively measured minute ventilation. This casts doubts on the possibility of predicting minute ventilation from the length of the gene expansion and highlights the need for direct observation through sleep studies. Background: Pulmonary surfactant deficiency is a rare (estimated at one in two million births in the USA) chronic respiratory disorder that can be fatal. At least three genes are involved. Surfactant pulmonary-associated protein B (SFTPB) and surfactant pulmonary-associated protein C (SFTPC) are secreted in the lung surfactant to increase pulmonary compliance and reduce the tendency for the alveoli to collapse. Adenosine triphosphate-binding cassette subfamily A member 3 (ABCA3) transports these proteins across the cell membrane. The first European diagnostic service was established in London, and screening has now been offered for more than 5 years. Analyses of the mutations are expensive (£1200 for all three genes) and time consuming (50 h). We present the genotypic–phenotypic profile of the referred population. Results: 114 samples were referred from all over the country in the past 5 years. Referrals have increased by more than 500%. Of the 114, 67 were new referrals, 44 carrier tests of the family of index cases, one perinatal and two prenatal testing. Reasons for referral were “bad/atypical” bronchopulmonary dysplasia, 15; interstitial lung disease, 18; pulmonary hypertension, 8; unexplained respiratory failure/persisting high ventilator requirements, 10; collapse at home, 1; persistent lobar collapse, 1; alveolar proteinosis, 3; and no clinical details available in 11. The SFTPB mutation was identified in 6/56 (11%), the SFTPC mutation in 2/46 (4%) and the ABCA3 mutation in 5/46 (11%). Four patients with SFTPB deficiency and two with ABCA3 deficiency had unexplained respiratory failure/persisting high ventilatory requirements. Two cases with ABCA3 deficiency and one with SFTPC deficiency had interstitial lung disease. Conclusion: Surfactant mutation analysis is now well established in the UK, allowing better genetic counselling. Referrals, however, need to be rationalised, for the service to be time and cost effective. Background: The natural history of the transition of childhood difficult asthma to adulthood is poorly understood. Our programme of protocolised investigations including flexible bronchoscopy has been ongoing for more than 10 years. Purpose: To assess the progression of childhood difficult asthma over at least a 5-year period. Methods: Children with difficult asthma previously assessed at Royal Brompton Hospital were re-studied at least 5 years later. We devised a questionnaire to assess the severity of their disease. The questionnaire was sent out to obtain answers to the following questions: Do they still have asthma? What is the current frequency of asthma symptoms? How many courses of oral steroids prescribed per year? What is the frequency of admissions to hospital/intensive care/emergency? What is the frequency of use of reliever medication? What is the smoking history? Is there any exposure to pets? What medications are currently used? All the subjects were also invited to attend for a detailed assessment including spirometry with reversibility, skin prick allergy testing, asthma control and quality of life questionnaires. The study was approved by the local ethics committee. Results: 44 patients have responded to the questionnaire. Two are no longer asthmatic, three are on step one British Thoracic Society (BTS) therapy (only short-acting β2 agonists), 24 are on step four BTS (inhaled corticosteroids and long-acting β2 agonists ± theophylline ± montelukast), 14 are on step five of BTS (long-term oral steroids). Two have died and two subjects have moved abroad. In seven subjects asthma was not limiting any day-to-day activities (see table). Conclusion: Many children with difficult asthma continue to have problems more than 5 years after the initial assessment, but 10% no longer meet the criteria for difficult asthma and one in six are well controlled on therapy. Omalizumab is licensed for the treatment of severe persistent allergic asthma in children over 12 years of age. Several studies have demonstrated efficacy in patients using reduction of exacerbations and asthma severity scores as the primary outcome measures. There are no data examining its potential effect in reducing long-term oral corticosteroid dose as the primary outcome measure. We describe our experience in a population of children with severe asthma who have undergone a 16-week open-label therapeutic trial of omalizumab. To date 22 children (16 boys, median age 12 years, range 8–16) have completed a therapeutic trial in our centre. Eight patients under 12 years received omalizumab off licence on compassionate grounds. The median IgE was 397 kU/l (range 119–661). It has proved possible to reduce the daily corticosteroid dose in 20 patients (median dose 12.50 mg pre-treatment vs 2.75 mg post-treatment; p = 0.01). 10 children completed modified quality of life (AQoL) and asthma symptom control (ACT) questionnaires before and after the trial. These measures increased in all respondents (median AQoL 2.7 pre-treatment vs 6.3 post-treatment, p<0.01; median ACT 9 pre-treatment vs 24 post-treatment, p<0.01). Lung function showed a small increase over the study period (median forced expiratory volume in 1 s 2.0 vs 2.2 litres, p<0.01). No significant adverse effects were reported by either patients or parents. The use of omalizumab in these children with severe asthma resulted in a statistically and clinically significant decrease in the use of oral corticosteroids while lung function was improved. Patients reported an improved quality of life and a reduction in asthma symptoms. A formal randomised placebo controlled trial of omalizumab in paediatric patients using oral corticosteroid sparing as the primary outcome is urgently required.